As I sat down to write this post about the wolffish, I set out to do my research and to my great sadness and disappointment, I discovered that Atlantic Wolffish is on the list of critically endangered species. Apparently it has been over-fished. So my conscience can not allow me to buy it any longer. 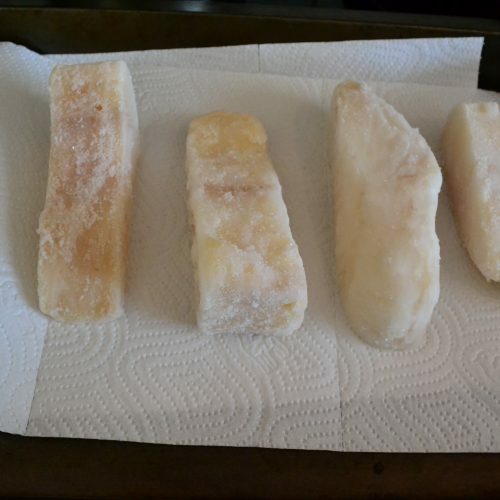 A while ago we had been gifted a box of frozen wolffish fillets from Møre Starfish Norway and I usually make it for special occasions, so this recipe has been staying in drafts for some time, but I have decided to post it now as my first and last wolffish recipe. 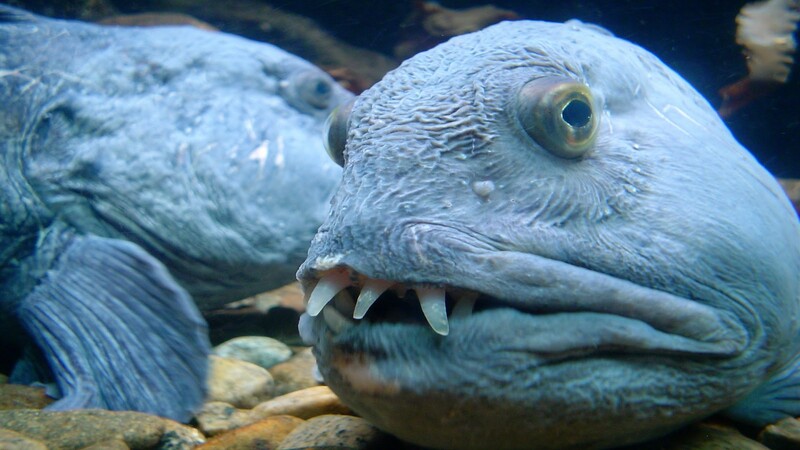 Wolffish is famous for its big teeth. It feeds on crustaceans and its name in Norwegian is Steinbit, which directly translated would be “stone bite”. This is how it looks like in the wild. I think it’s kinda cute. It is one of my favorite types of fish and it is a pity that is has been over fished. As I wrote before, I wasn’t sure if I even should post this recipe, since we decided to stop eating it, but it is there, all pictured and prepped, so it would be a waste not to publish it. 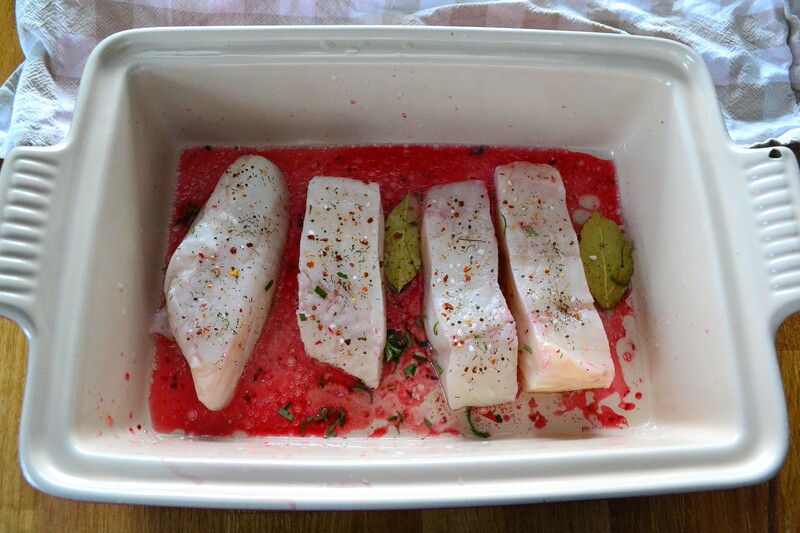 Besides, this way of marinading and baking would be suitable for any “meaty” fish, such as monkfish. Wolffish is easy to bake, but it shrinks quite a bit, due to high fat content that will come out of under skin membrane during cooking. Here, I make it two different ways for two different occasions. One is with herbs and fennel and another is in citrus marinade. Both are great, but the citrus one is more popular with children and the fennel and herb one is great with white wine. I love using blood orange or red grapefruit for the citrus marinade to make it pink, but the juice of common orange will work as well. 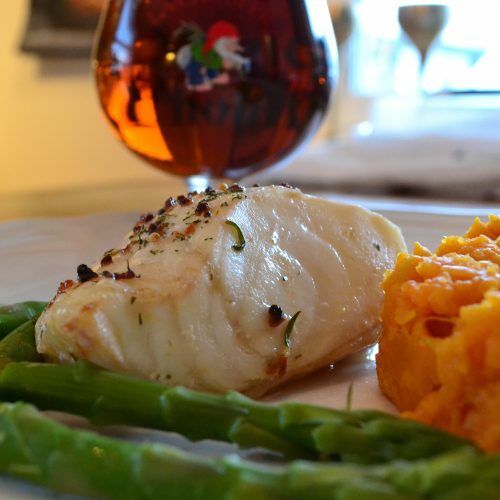 I also love to use Norwegian fish spice blends, as you can see on images below, it consists of a variety of spices. I’m pretty sure such spice blends could be found in other countries and cuisines. 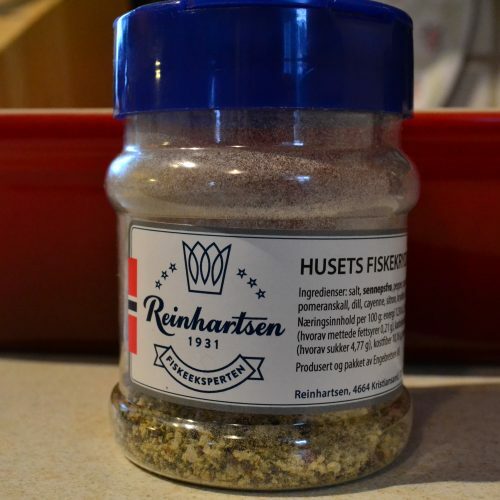 Typically it would contain salt, dry dill, mustard seeds, black and white peppers and some other herbs. Sometimes chili flakes, like mine here. Wolf fish has a very distinct taste, so I find it better served with simply cooked vegetables. Here is my two favorite marinades for wolffish. Both are great, but the citrus one is more popular with toddlers and the fennel and herb one is great with white wine. 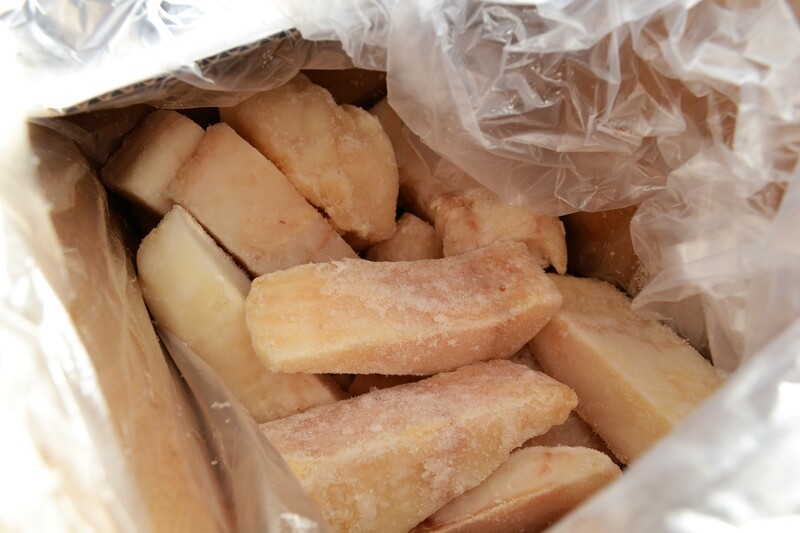 Defrost fish fillets at room temperature or overnight in the fridge. When defrosted, squeeze out as much liquids as possible and pat dry. Don't worry, fish won't be dry due to marinade and high fat content in under skin layer. Prepare the marinade of choice by combining all liquids together. Pour the marinade at the bottom of baking dish, place the fish in and rotate, to ensure it has a bit of marinade on all sides. Add bay leaves, chopped herbs and sprinkle with spice. 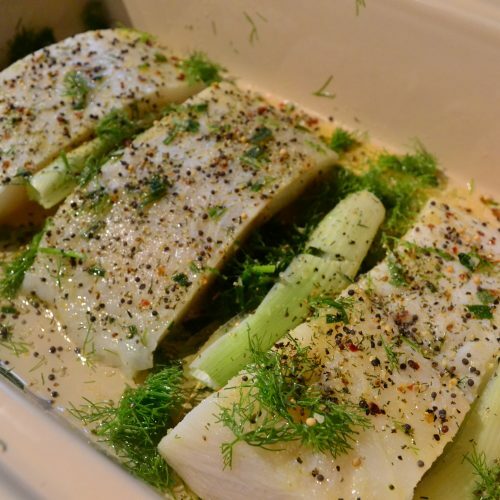 For fennel marinade, slice the bulb vertically in few slices and arrange between fillets. Chop the fronds and sprinkle around. They will become crispy when done. 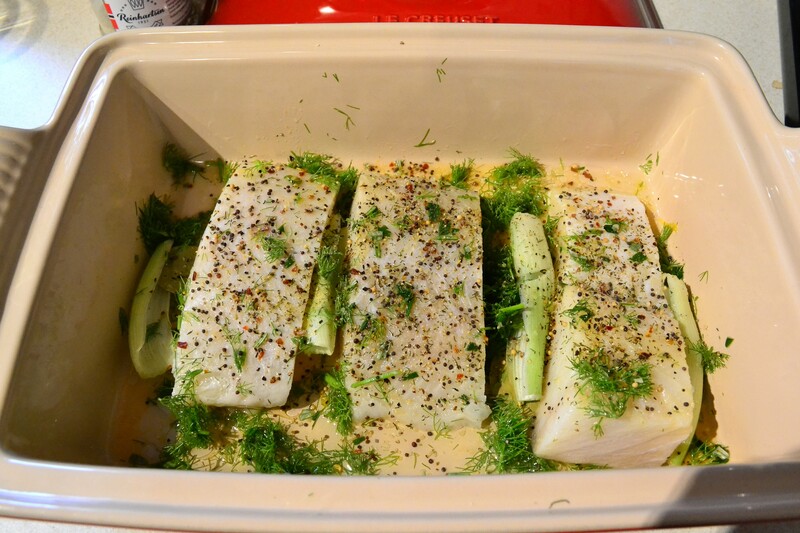 Let the fish to marinade in refrigerator for an hour, or more if you have time. When ready, bake the fish at 200C for 20 minutes. It should shrink and be opaque when done. 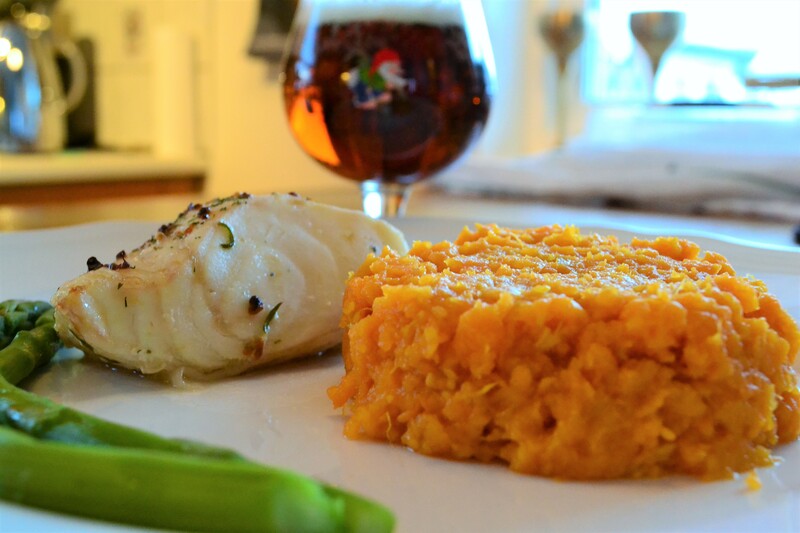 Serve with simply cooked vegetables and a glass of wine or beer.